Divorce in Medieval England is intended to reorient scholarly perceptions concerning divorce in the medieval period. Divorce, as we think of it today, is usually considered to be a modern invention. 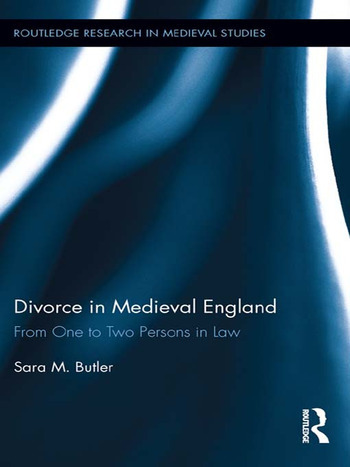 This book challenges that viewpoint, documenting the many and varied uses of divorce in the medieval period and highlighting the fact that couples regularly divorced on the grounds of spousal incompatibility. Because the medieval church was determined to uphold the sacrament of marriage whenever possible, divorce in the medieval period was a much more complicated process than it is today. Thus, this book steps readers through the process of divorce, including: grounds for divorce, the fundamentals of the process, the risks involved, financial implications for wives who were legally disabled thanks to the rules of coverture, the custody and support of children, and finally, what happens after a divorce. Readers will gain a much greater appreciation of marriage and women’s position in later medieval England. Introduction. 1. "Why Did They Leave?" 2. "The Logistics of Divorce" 3. "The Risk Factor" 4. "Whose Property is Whose?" 5. "What Happened to the Children?" 6. "What Happened Next?". Conclusions. Sara M. Butler is Associate Professor of Medieval History at Loyola University New Orleans. Her first book was The Language of Abuse: Marital Violence in Later Medieval England (2007). She has published also on suicide, violence against children, abortion, and medical practitioners at law.